also cooking skills inherited from my father. Too many to list. Very flexible. Scary evil voice like a sith lord. if you've enjoyed my Voice Acting in some way shape or form and have enjoyed working with me, or I did work for you as a Voice. Then please leave me a positive review if you are willing . I may try to write ones for those I work with as well, or directors I work for, who knows.. Trust me leaving a positive testimonial/review helps me greatly! You can read more below if you'd like. I'm a professional Freelance Voice Over Artist/Actor and Graphical Designer, I'm most Active on Deviant Art mostly for my Artwork and mod making, although I try to be active on all my other social media as well however if real life like keeps me busy or I'm in need of a break from the Internet for a while I am sometimes nowhere to be found at times but don't worry I always make a return eventually. I make sure to be done with Voice work or inform others what I'm working with beforehand first so all are satisfied with completed work if this happens. Sometimes I just need to take a Hiatus because of my health issues. I often trick my family and friends, even they don't notice my many different voices right away if I'm in a video or animation, when they do notice it's me they are usually fairly impressed I pulled it off and that they didn't catch it sooner. Besides this I also do Sims Machinima's as well as random fan made videos to showcase something. If you have a project or a voice of mine catches your fancy or you believe would fit your character please do contact me so we can discuss details as I may be interested in lending you my talent if I'm interested in the project, that is. Give me all the details, please be specific and please be absolutely sure you need me before asking me because I've worked with many that cancelled projects last minute which never saw the light of day which is a terrible thing for someone like me who put lots of time and effort into their work, it's why I may ask for testimonials along the way just to ensure not everything is for nothing in the end. And I do editing and clean up the audio for upload which is a major pain lol. I do most work for free so long as Credit is given and my username is added to the credits, and sometimes like I said a testimonial sometimes. If a project is multiple lines I may require compensation. Yeah, I also do paid work too. 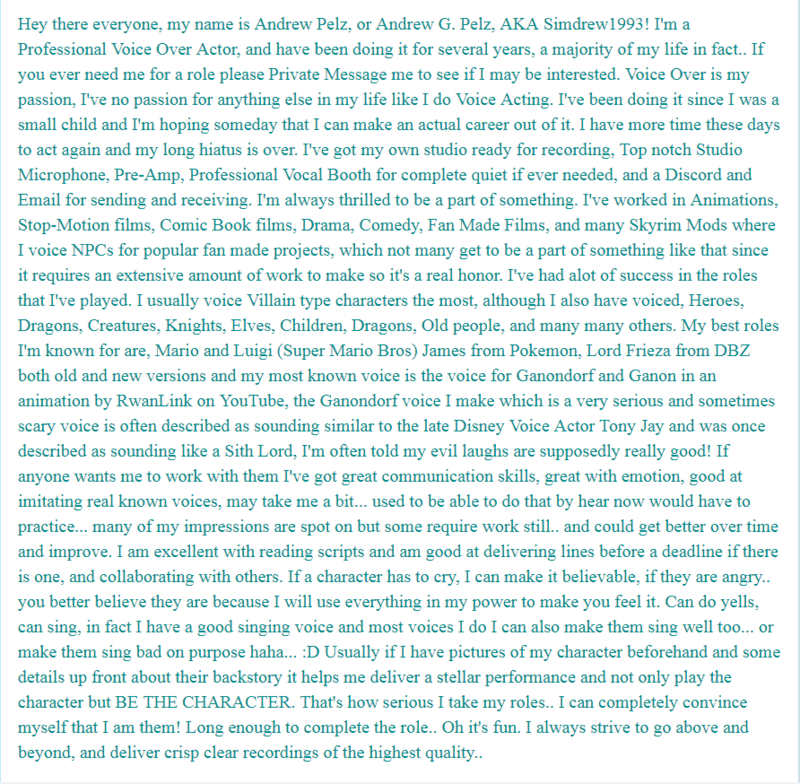 Anyway when adding me to credits it's Simdrew1993 with a capital S and a link to my YouTube Channel if possible as well, and my real name Andrew Pelz, or Andrew G. Pelz is also welcome in credits too if you like using an actor's real name in your project as well just make sure if you do it's along with my username, make absolutely sure my username is visible with it because people need to be able to find me and my pages. Any publicity I can get! I may not have as much support or a fanbase as I'd like but there will be a day when I will and hey it helps a guy like me. Although if I am given far too many lines I will usually require compensation for my time via Paypal, or a positive testimonial if I don't want money, because Voice Acting may be fun in all but it is also still lots of work! My pricing really depends on the project and how many lines your gonna have me do. Otherwise it's free if I agree to work with you on a fun project, I do free work all the time usually these are only short projects though, not too many lines. If however it's a really long project with hundreds of lines, I will need compensation for how much work and time it requires. For long line projects I may request for it to be a work at my own pace with no deadline in order for me to agree, for health reasons or not having enough time, I won't work on something if I have to rush, unless lots of money is involved, then maybe. And don't worry, I'd still try to get you your lines as soon as I am able to. I'm gonna list a few below. Videos of the series: I voiced for 3 eps, episode 3 hasn't surfaced yet. Super - formerly known as So0per.. - I voiced Super Mario in a Sonic The Hedgehog Motion film, was probably his best video.. unfortunately it was hidden on YouTube.. odd though because the comments were all positive and rating were good had very high amount of likes and little dislikes people loved it. Unfortunately the creator didn't see how much people loved the video I guess. There are many others since I've been voicing for years now. I'd like to be more well known although I also don't want people to ever get tired of me either, so I act in how you say, moderation? I guess that would be the correct term. I don't act as much as I'd like to in fear of ever becoming the guy everyone knows and is tired of, I want to always be relevant. I have several, just need to get them all on here...May take a while...I will update info and add them over time. I want to extend my review of satisfaction in working with Simdrew1993. On a level of professionalism, he works quick and efficiently while keeping his clients informed of the progression he makes on each new project. Not only does he respond in a timely manner with his clients, he will continue to work with them until they are very satisfied in creating a voice for a character. His work on my own project has been exemplary and gave impressive results upon finishing. His organization of sound files is very clean and organized, once all recordings are completed, packaged, and sent to his clients. I recommend this voice actor to anyone who is looking for a deep masculine, but mysterious voice to give life to any character that specifically calls for this type of talent. 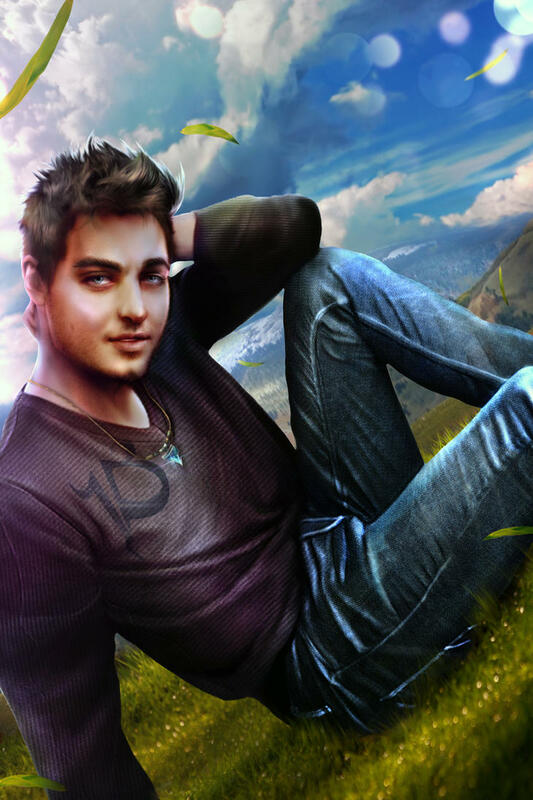 I am pleased to have worked with Simdrew1993 and wish to work with him more on future animation productions. Simdrew1993 has been a pleasure to work with. His talent first shined through his voice work as the Joker in a Batman film and more recently as Namor in X-Men. Without a need for specific direction, he is able to get into character and deliver a performance you don't often hear. I would recommend him to any director that is looking for a quality actor who is passionate about the craft of voice over. I have been very impresses by your talent and responsivness. You are such a great person always positive and with good mind ! You are able to understand fast what's the ideas I was looking for and also you give me even more choices than I requested. It really helped me a lot ! Your work is very pro and It's been a pleasure for me to work with you and I would do it again without any problem. You helped to go one step closer to my dream. I wish you all the best ! "Simdrew provided very good voice acting with high quality audio. He is always friendly in communication and willing to take on feedback. He also provided lots of retakes to choose from, which was very helpful at times. We were very pleased with the work he did for our project voicing our Crestfallen character, it was a pleasure to have him be a part of it! Lead designer and creator of the new lands and quest mod "DarkenD" for TES5 Skyrim"